How would that concept enhance your life? What does Pearson say about the relationship between faith and doubt? What does he think faith is? How does that correspond with what you think the word “faith” means? At one point (p. 179), Pearson says, “Faith is the anticipation of the existence of God and God’s blessing. Religion is the quest to systematize that feeling, to organize it under rules and laws.” If that is true, how is Faith useful to us? “Many so-called believers believe in a God in whom they are profoundly disappointed, as well as being in profound terror of. They have faith, but is their faith positive and redemptive? Or is it a kind of doomed resignation – a faith that anticipates a cruel, unreasonable, and arbitrary God?” (p. 180) What things do you believe that are redemptive and positive? What do you believe that is punitive and negative? “In reaching out to others, Christians make the error of assuming that the superiority of our doctrine is self-evident – a mentality that it is disrespectful and counterproductive as well as extremely naive.” (p. 181) Not to mention exceedingly arrogant and vain. Making the case that the Bible is one of many sources for belief, Pearson says, “I don’t view the Bible as so much the inspired Word of God as the inspired word of men about God.” (p. 182) I would state that just a bit differently: “The Bible is a collection of the words of inspired people about God and God’s people.” But Pearson goes on to say, “And some of the so-called inspired Word is not ‘expired’ and irrelevant.” How does that make you feel? “One of the reasons religion finds itself increasingly obsolete … is that it refuses to change or evolve with the fabric of human progress, expecting society to change instead.” (p. 183) Have you noticed evidence that what Pearson says is true? What have people said that indicates that they think religion is obsolete? How do you respond to that? Pearson makes two bold statements on page 184. Beginning with “When I say God is not a Christian, I am not saying that Christ is not God,” and ending with “In a sense, I accept the agnosticism of my faith.” What effect did his argument have on you? Pearson says that faith has been replaced by blind faith. (p. 185) Do you see that as true? If you don’t need faith to be saved (p. 188), then why be a Christian (p. 189) at all? Pearson discusses the meaning of Hebrews 10:31 on page 195. What truths did you discover in what he said? What trappings of our faith bind us up? 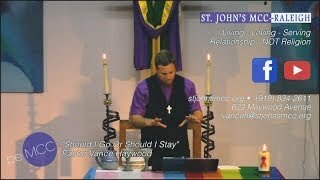 What are some of the ritual things that we do at St. John’s that are a detriment to people discovering their own faith?